The Star adds cocktails and sandwiches to its winning, Chicago-inspired formula. 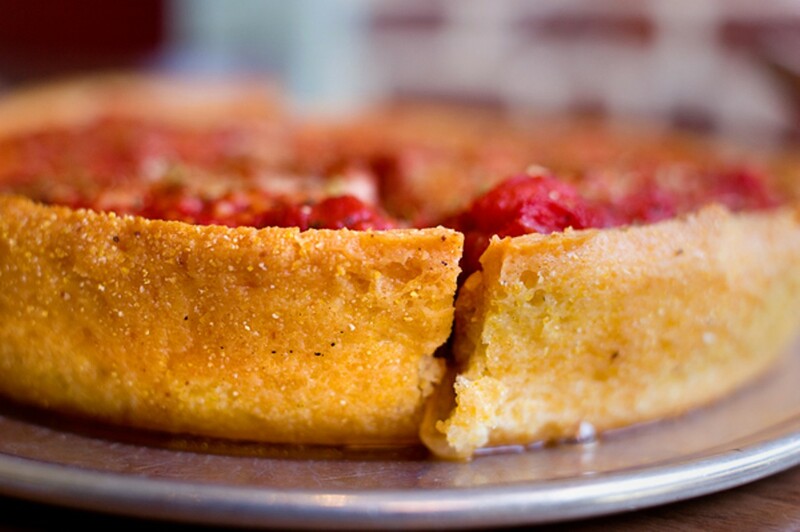 The deep-dish crust has cornmeal, which gives it a wonderfully crunchy texture. Let me start with a disclaimer: I love Little Star Pizza. 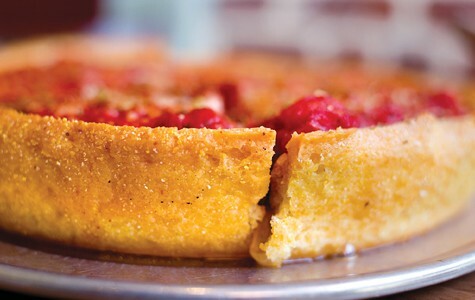 Ever since the San Francisco-based temple of Chicago-style deep-dish pizza opened its first East Bay location, in Albany, three years ago — when I took my first bite of that crisp, cornmeal-based crust and tasted that chunky, perfectly balanced sauce — well, let's put it plainly: No other deep-dish pizza has had a place in my heart. What I love, especially, is how each Little Star serves just a few simple things: a couple of salads, garlic bread, and, of course, those glorious pizzas. And all of them come out pretty much perfect every time. So when I heard that Little Star co-founder and pizza-recipe developer-in-chief Jon Guhl was opening a new restaurant in Oakland's Grand Lake neighborhood, called The Star on Grand, and introducing a cocktail program and several new dishes to boot, I was psyched. But I also wondered how the restaurant's tried-and-true concept would do in a larger space with an expanded menu. Would the kitchen be able to maintain the same level of consistency? Really, though, the ways in which The Star differs from the other Little Star restaurants are small. One is the name: When Guhl and Little Star co-founder Brian Sadigursky dissolved their partnership earlier this year, dividing up their existing properties, the two agreed not to use the Little Star name for any new projects. Pizza is still the focus, and The Star offers several more choices for both thin-crust and deep-dish pies, including the option to build your own pizza from a list of thirty toppings. The pizzas all have Bay Area-themed names, but many of them are the same as the Little Star combos. The "Grand" (spinach, ricotta, mushrooms) is very similar to Little Star's "Little Star"; my favorite, the "Port" (sausage, mushrooms, bell peppers) is indistinguishable from the "Classic." During one of my visits to The Star, I tried one of the thin-crust pizzas and found that it, too, was surprisingly good. The crust is crisp and cracker-like without being dry, with just a dusting of cornmeal. My sauce-less Tribune (garlic olive oil, ham, bacon, ricotta, emmenthaler) came to the table dripping with hot grease, like a classic New York slice, and the flavors blended together harmoniously. Most of the other new menu items fall in the solid-but-not-exceptional category. The best of the new appetizers was the meatballs — a dense version you'd be more likely to put on a pizza than in a bowl of spaghetti, which, of course, makes sense. But pass on the stuffed mushroom caps, whose "stuffing" I found mushy and insubstantial. If you aren't afraid of ODing on carbs, get the garlic bread — arguably the best in town. Just like at Little Star, The Star serves a "deconstructed" version, allowing you to slather each piece of warm bread first with soft butter and then with cloves of garlic that have been roasted until they're soft, earthy, and sweet. Probably the most significant additions are four sandwiches in the Italian-American grinder/hoagie/sub tradition, all served on East Coast-style soft French rolls. The one featuring a spicy calabrese sausage and a big slather of marinara sauce was the best sandwich of this style I've had since Uncle Dougie's in downtown Oakland closed. I also liked how the sandwiches came with a side of house-made giardiniera, a kind of pickled relish that's a refreshing alternative to your standard dill pickle or scoop of slaw. The carrots, cauliflower, and celery in The Star's version were cooked soft and weren't overpoweringly vinegary. Still, it's hard to justify ordering an $11 sandwich when I can have a personal deep-dish pizza for $9. But Guhl said he's working on another menu addition: a real-deal Chicago-style Italian beef — a sopping-wet, gravy-soaked, giardiniera-topped roast-beef sandwich. If he pulls it off, that might be a good enough reason to skip the pizza. So is this bigger, broader-menued restaurant an improvement? Not necessarily. It is nice to be able to enjoy a pre-dinner cocktail, and the large space means you can almost always snag a table. But it also means that on certain nights, with one-hundred-plus diners in the house, the kitchen might get slammed. One Saturday, we ended up waiting 45 minutes for our pizza. And when it came out, the pie seemed slightly saltier and more sloppily put together than usual. It was enough of a downer to make me want to avoid busy weekend evenings for a while. In any case, my favorite meals came during lunchtime, when the restaurant seemed to be mostly empty — maybe because it sits on a section of Grand Avenue where there isn't much foot traffic, or maybe because word just hasn't gotten out. No matter: Snag a spot in the restaurant's small parking lot (itself a minor miracle in Oakland) and take your pick of any seat in the house. You'll be in and out in less than 45 minutes, and you can pretend, in spite of all the accolades, that The Star — and even deep-dish pizza itself — is some hidden secret that you alone have discovered.